Moscow, February 04, 2018 — Business Systems Consult. 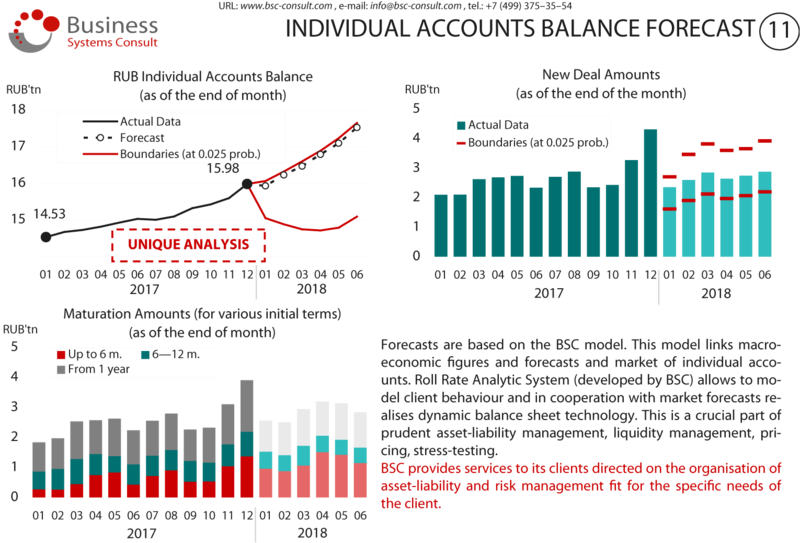 Consulting Company BSC prepared monthly review of Russian Banking System as of December, 2017 (in Russian), which covers the general tendencies and presents market shares of major participants. Detailed report is available upon request. 1. Balance value continued its growth and increased by RUB 1,8tn (after accounting for exchange rate effects): the major source of this growth is seasonality in deposit markets of individual clients. 2. 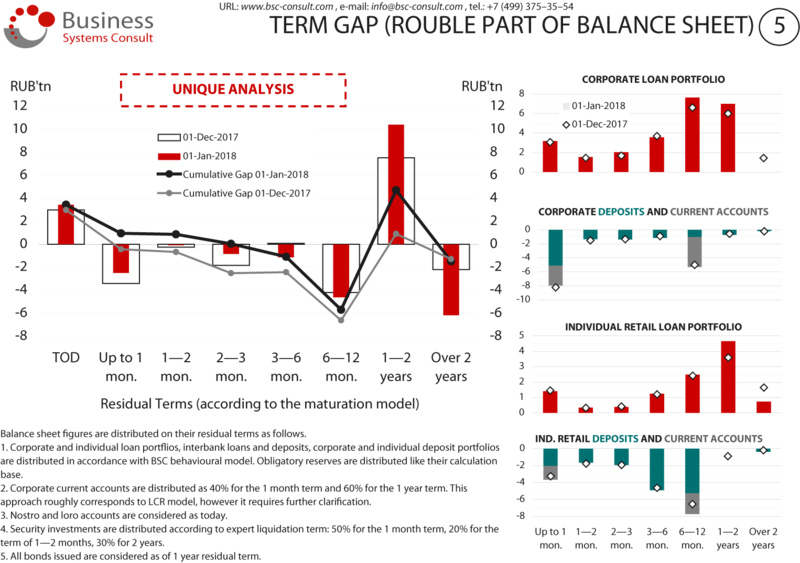 Retail individual balances (both deposit and loan portfolios) are reflected in RUB balance sheet term gap. Liability amounts of the residual terms 6—12 months grew as well as assets of the higher terms. 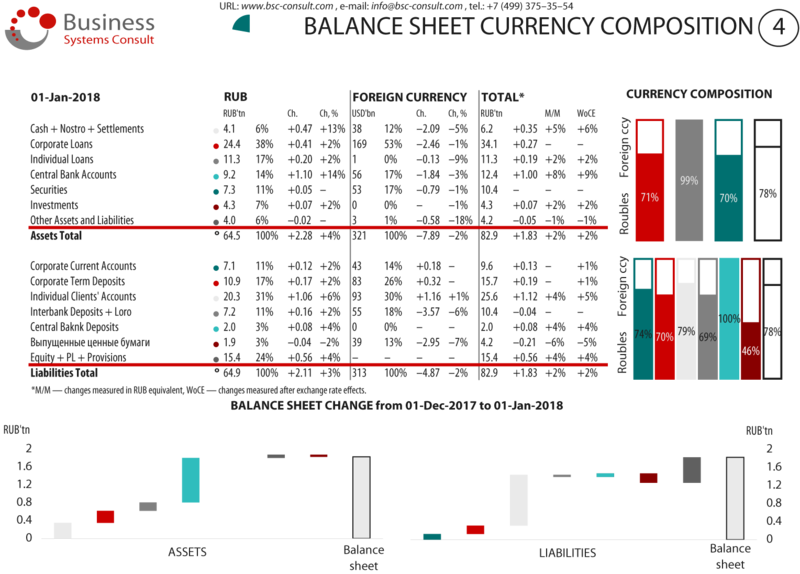 Residual terms of foreign currency balance sheet decreased due to corporate deposits. 3. 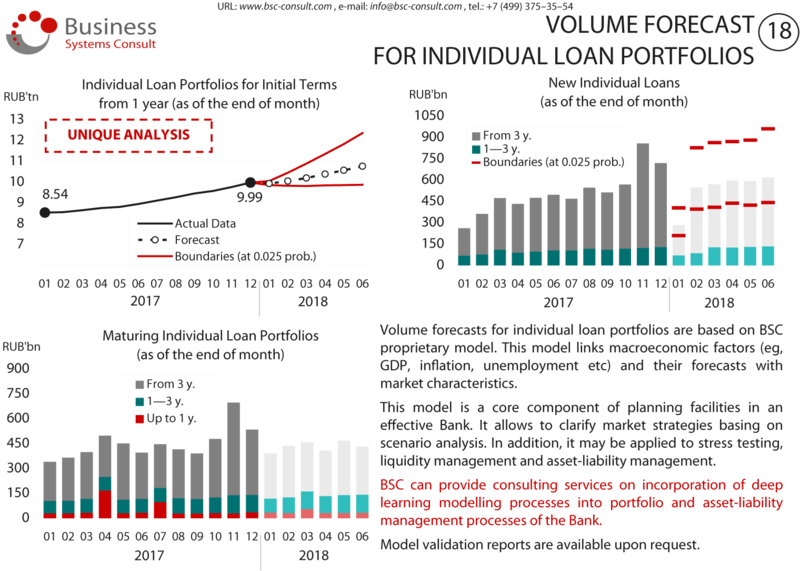 Corporate loan portfolio grew due to the operations of GPB, Otkrytie, RSHB, and grouping of other banks. Loan portfolios nominated in foreign currencies flowed from Sberbank to VTB (USD 2,5bn). 4. Deposit portfolio of individuals rose by RUB 1,2tn. We expect growth to continue, however we estimate the risks for the portfolio value as high. 5. Corporate loan portfolios grew by RUB 410bn mainly due to operations of VTB, Gazprombank and 6—20 grouping of banks. 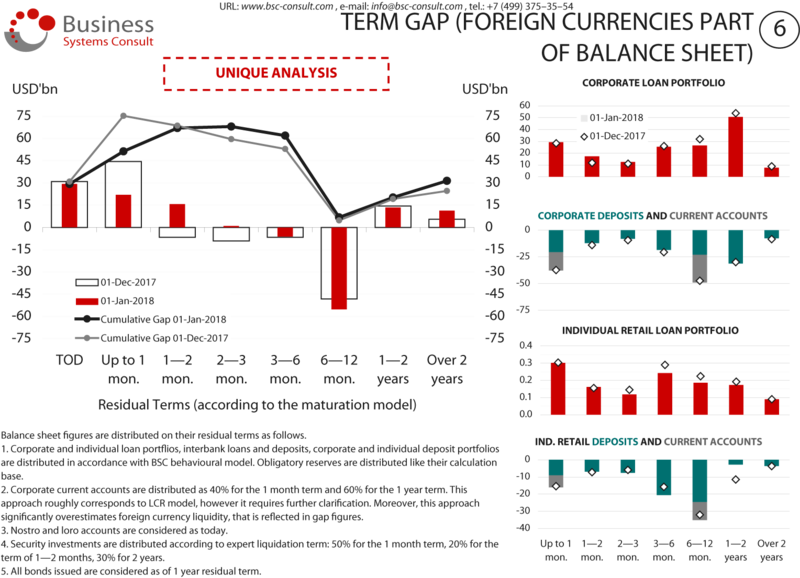 In foreign currency part of the balance sheet, VTB and GPB raised their portfolio at the expense of 6—20 grouping of banks (USD –4,7bn). 6. 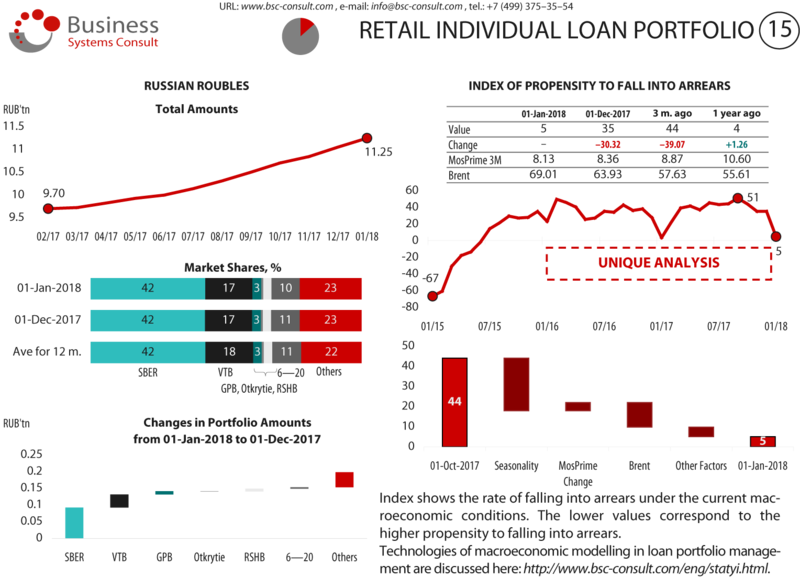 Retail loan portfolio of individual borrowers rose by RUB 200bn. We expect this trend to continue after seasonality effects of January. Deterioration of macroeconomic conditions is also a product of seasonality with implication of oil price increase. 7. Foreign currency borrowing from Russian Central bank appears to be over. Structural liquidity surplus is growing, saldo of lending and borrowing operations with Central Bank is RUB 2,2bn.